Misty Diaz, despite having spina bifida, has competed in more than 200 obstacle and endurance races on crutches. 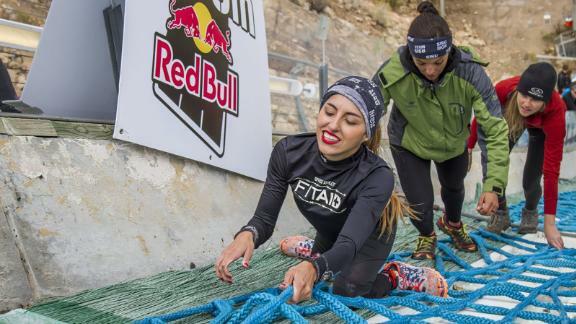 Misty Diaz showed no fear as she lined up for the Red Bull 400, a brutal foot race straight up the Olympic ski jump in Park City, Utah. She's conquered that 400-meter sprint twice. In fact, the 34-year-old competed in more than 200 obstacle and endurance races -- all of them on crutches. Diaz has a severe form of spina bifida, a birth defect that kept her spine from developing properly. Doctors thought she'd never walk. By her mid-20s, the pain and exhaustion of 28 surgeries left her depressed and addicted to opioids. It was rock bottom. "After making a lot of mistakes and just really having a hard time trying to find my place in the world, I was left with an option," the Los Angeles native said. "We can stay in the position that we're in and hope for better results, or we can be uncomfortable and make strides and changes." Diaz decided to make strides, literally. "I started doing something that I've never thought I would do before, and that was simply just walking." She started with small goals: walking to the mailbox. Then walking around the block. "I just kept going and going," Diaz said. In early 2012, she ran her first race, a Ronald McDonald House Charities 5K. "Crossing that finish line, I was so happy from my gut." Diaz said of the 3.1-mile run. "I was like, 'I've got to tell everybody that it doesn't matter if you can't walk. You can totally do a 5K!' "
Diaz picked up speed and confidence in more 5Ks and eventually started taking on half-marathons. But she wanted more. Her coach happened to also train people for Spartan Races, popular endurance runs that include crawling under barbed wire and over walls and leaping over fire. Diaz was her coach's only "adaptive athlete." But for someone who spent a lifetime facing obstacles, the extreme race was a natural next step. "We looked at each other, and we're like, 'well, you're already running a half-marathon. Why don't you run the Spartan Race?' "
On a December morning in 2014, Diaz bolted across the starting line of her first Spartan Race and headed for the first obstacle. "You have to strategize," she said. "Sometimes you'll see me on the course where I'm looking at an obstacle, and people are just crushing it, and I'm like 'OK, let's figure this out.' "
The races and obstacles are not adjusted for Diaz. Whether it's a Spartan Race, a half-marathon or the Red Bull 400, she runs the exact same course as regular athletes. It comes down to her own strength and guts. In the race up the ski jump in Utah, she went as far as she could on crutches. The rest of the way, she pulled her body along using just her arms. "I remember my lungs just hurting so bad because I couldn't catch up with the elevation." Despite the pain in her lungs and her burning arms, Diaz darted up the steep ramp, almost a quarter-mile long, in just 25 minutes. "It was just nonstop, continuous momentum," she said. "It's like life. You just make adjustments, you set goals, and you just keep going." Diaz has no plans for slowing down. She has a lot of fans and hopes her racing inspires others. Meantime, she's trying out a different sport: adaptive skiing. The California girl is new to the slopes (at least new to sliding down the slopes), and she's taken her share of beginner's tumbles. But Diaz insists it's worth the ride. "I had the freedom to be on a mountain with no fear. If I fall, I fall. But I know I have the ability to do anything."